Including Gift Aid and my initial £300 to secure my place on the team - pleased and spurred on by by the boys at dodadog.com who are offering to support me on their fab new site for dog people. More of that later. The last few days have been lovely and cold, great training for me but the girls are not so keen. 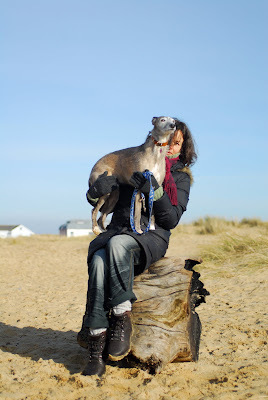 The sun did come out today and we went for our regular Wednesday walk with Anna and Maisie - Maisie is on a diet and in her insatiable hunger she had eaten rather a lot of flotsam and jetsam from the beach and been 'slightly unwell' overnight. Poor Anna had been woken regularly by demands to be let out.